The major part of the site at Bridge of Allan (the games car park area) is designated by SEPA as an area liable to flood in a 1 in 200 year chance and as such the advice is that Local Authorities should avoid any house building in this area. The 1:200 area also includes the houses at the top of Churchill Dr. The Developers engaged a firm of International Engineering Consultants, Buro Happold to do a flood risk assessment. Buro Happold are more usually concerned with major projects such as building museums and hotels rather than local housing developments. 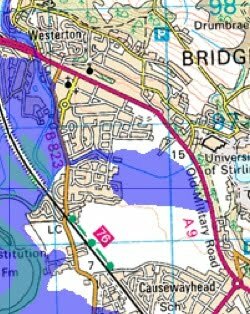 The engineers report acknowledges that part of the area is affected in a 1:200 year event and will have improved surface water management - proposed loch would be stagnant. According to the report the flooding related to pluvial(rain fall) sources(!) largely due to limited field drainage. The engineers acknowledge that some of the flooding is related to flooding on the Allan Water. They then fudge their findings with the following statement “Data for a 1:200 year event with climate change is still being compiled and as such a 1:500 year event has been tested to extreme conditions. This establishes that some localised areas of the site along its southern boundary are affected to a shallow depth of .2m” Some climate change predictions has the whole of this area under the sea in 500 years! All of these points would affect the amount of flooding but appear to be absent from their report. SEPA have been asked to comment on their 1:200 calculations and we will include their response when received. "In recent years, floods in the region have become increasingly common, a trend that is predicted to continue. A recent analysis of the flood risk in Bridge of Allan estimated that 340 residential and commercial properties would be at risk from flooding by a 1 in 200 year eventwith estimated damage in the region of £12.5 million"